If you guys know me, then you know I love to shop sales, thrift, and second-hand stuff. There's something about getting a good deal on amazing pieces that make me feel good. For today's post, I collaborated with thredUP, the largest online consignment and thrift store! Keep on reading because I'm super excited to share this look! I was challenged by thredUP to wear more color and love life in color. For me, during the summer when it comes to my looks I love to play with patterns, prints and lots of vibrant colors. 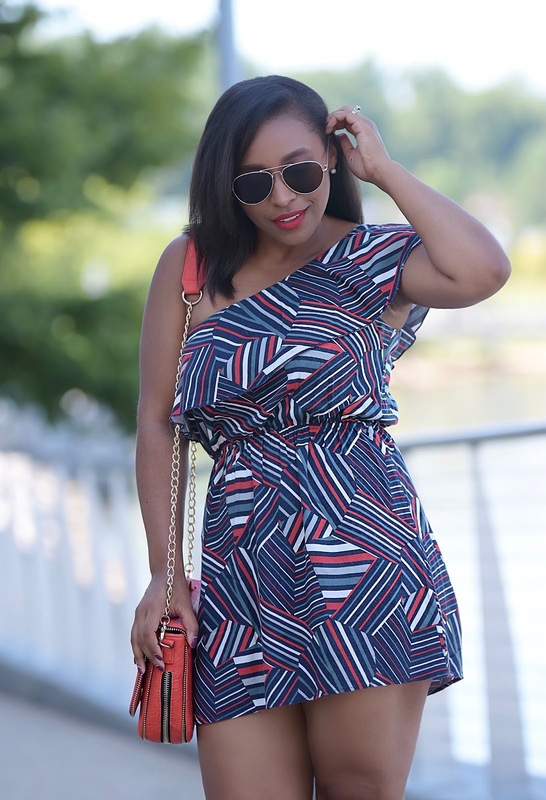 This dress from thredUP was perfect for the theme. The print and the color was what drew my attention and the one shoulder ruffle was perfectly on trend. You guys all know how I feel about the "cold shoulder" looks. The dress fits loose which is always great for those hot summer days. I paired it with a bright red satchel that has amazing details. I love all the gold zippers and chain. This is one of those purses that look small but you can honestly fit your whole life in. Haha, my kind of bag. Okay guys guess how much these two items were?? They were $11.99 each! The dress was Lovely Day brand originally $36 and the purse was Street Level brand originally $69. I saved $81.02 on two amazing finds! That's the part of thrift shopping that blows my mind. thredUP is changing the way people think about secondhand shopping. For me, it's such an amazing experience to know I find designer gems for half the price! Do you guys love secondhand shopping? Hope you guys enjoyed this post and loved my finds as much as I did! I really love the pieces you got babe... Love the bag! wow really good job babe...!!!! me encanto la cartera el color esta bello, y el vestido muy lindo luce muy fresco I love it! Gracias Alicia! Can't believe how much I saved! Are you need or like Wedding Dresses，if you need or like and welcome ，clavonna professional dress rehina reviews here you can find best dresses for your big day!